Ever notice when you are in the market for a new car, the one you want is the only one you see everywhere? Similarly, an editor knows grammar, they have an ever-constant inclination to spell check every email that passes through their inbox. Or if you are a speaker, do you find yourself subconsciously critiquing other speakers on stage or videos for their content, delivery, and stage presence. The same rings true for designers. I notice poorly created design because it stands out for the wrong reasons. Simply put design is about the choices the designer makes to convey their message, content, and brand. The design is as equally important as the information itself. When design is done well it serves to communicate the message more clearly and beautifully to the audience. Professional design separates itself from amateur design because it follows core design principles. Below are just a few examples of good design versus bad design which helps you refine your eye. The list could go on but the basics of layout, type and color will get you started. For instance, kerning type is basic. It maintains proper spacing between letters which should be pretty obvious. 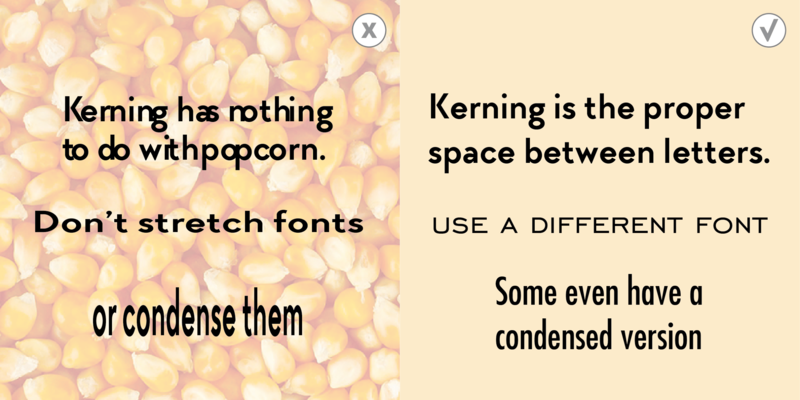 Clean kerning allows for font to be legible, crisp, and easy to read. This is especially relevant for paragraphs of text. It may be tempting to manipulate a font by stretching it horizontally or vertically, but this is also not recommended. If you need to fill your space by stretching out your words or shrinking them, select a different font. 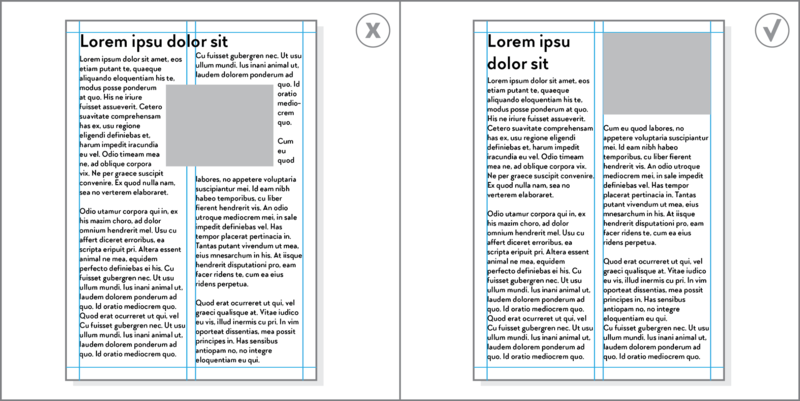 When it comes to design, grids are your friend. Whether it is a two column, three column, or four column grid, a consistent grid provides order and a template to follow. The same goes for rules of thirds and the golden ratio which are often utilized by photographers, artists, and architects. The use of grids create a mathematical, visually pleasing, and consistent design. This is why many apps for phones provide grid layouts. They make it easy for users to drop their images into templates. The color scheme a designer uses can either make or break the overall look and feel. Choosing the right color palette helps to convey the right message. Often it is best to stick to colors which are complementary to each other on the color wheel. Colors suggest different things. For instance warm colors like red, orange, and yellow suggest love, warmth, and energy while cool colors like green, blue, and purple suggest natural, freedom, and decadence. 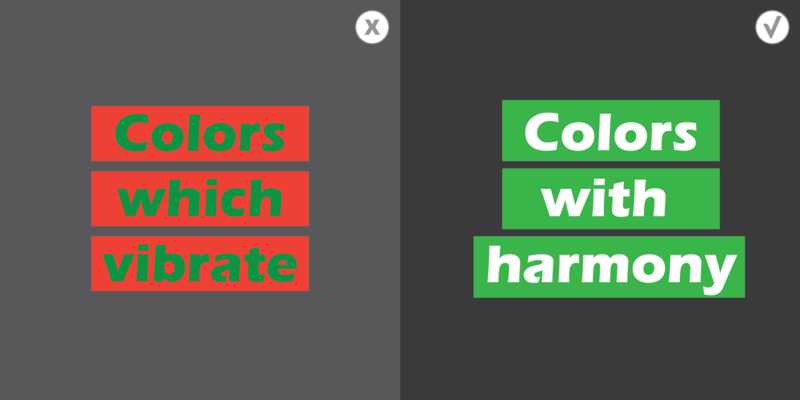 Avoid color combinations which are on opposite sides of the color wheel. These colors tend to create a vibrating effect. This is because the transition from one color to the next is muddied. I once worked with a graphic designer, and I could not understand why the designs he presented looked like they were vibrating until I learned he was colorblind. Utilizing colors with greater contrast eliminates this vibration. Avoid the overuse of fonts. Two or three fonts are sufficient in most cases. Too many fonts make the design look cluttered which doesn’t lend itself to a hierarchy of information. It is also important to choose the right fonts. Just like color, fonts also suggest certain moods or emotions. 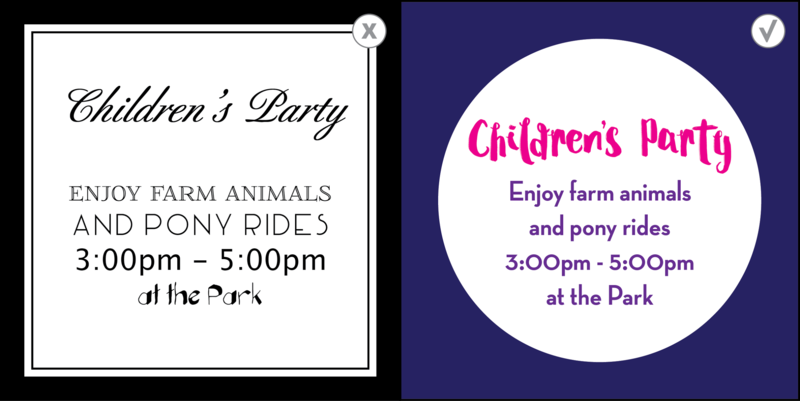 The script font on the left used for “Children’s Party” is much less kid friendly than the one on the right. 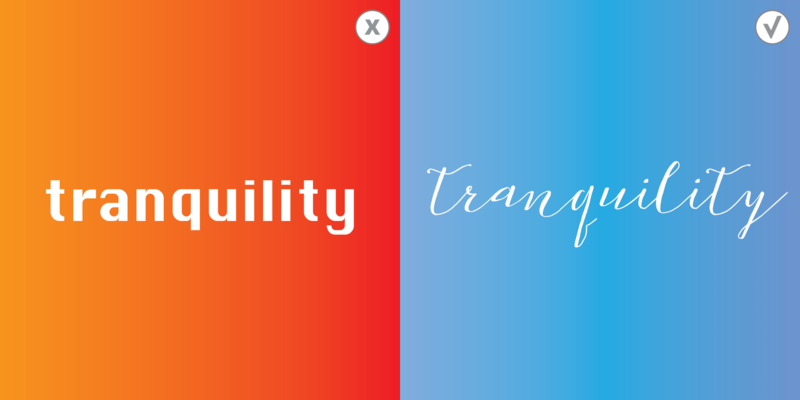 Likewise the font used on the left for the “tranquility” example above looks more robotic than tranquil. When it comes to design as with most projects, you get what you pay for. If you want to set yourself apart and have a consistent brand image, it is better to hire a professional who helps your work stand out. Make sure you provide examples of the kind of branding you like, as well as description words like crisp and highly sophisticated versus rustic and romantic. If it’s not in your budget ask someone you who is a graphic designer or check out a freelance designer site. For instance https://www.fiverr.com or https://www.freelancer.com/jobs/Graphic-Design/1/ helps connect you with design professionals who want to help you with your projects. Every designer has their own style and flair, so whoever you decide to work with it is always a good idea to review examples of their work to determine if you like their style and skillset. Julie Landreth has twenty years experience in design and photography both in corporations and as a freelancer. She has worked for companies such as Texas Instruments, Fossil, NCR, Kohler Co., Shutterfly, Tiny Prints, and Wedding Paper Divas. She has also been a part of the team who designs graphics for KathiLipp.com. She is a speaker who loves nothing more than inspiring wives on how to pray for and love their husbands well. You can follow her on Instagram or Facebook or sign up for her newsletter.